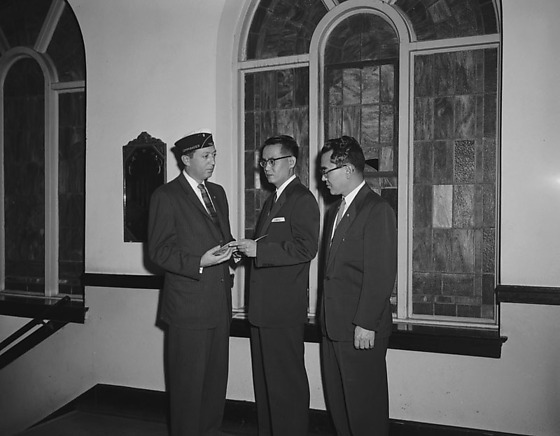 Men in suits at Citizenship recognition night where Naturalization awards were presented to winning naturalized Issei essay writers at Union Church in Los Angeles, California, November 30, 1956. Includes two men presenting booklet to a Caucasian man in an overseas cap, "Commander" and "792" in front of stained glass windows; and three men holding hands as they stand in aisle. Typed on original negative envelope: American Citizenship at Union Church.